See What the Sondes Measure by viewing the videos below ! Measurements of particles and flocs (muck and fluid mud) movement in & around dredging sites using directional mass flux (mg cm-2 sec-1) instrument probes or Sondes and particle velocimetry, airborne and bottom hyperspectral images & spectra. Transect and station data. See the images below and the articles referenced below to see muck and fluid mud, the sondes - what they measure and how they operate. The Sondes are probes and are used in conjunction with in-situ BRF targets and shallow water gravity wave measurement devices originally designed and published in an article by Dr. Bostater, during the Spring of 2014). The sondes measure the mass flux (g m-2 day-1) of moving muck and fluid muds in the bottom boundary layer in aquatic systems. When deployed as vertical arrays they quantity the actual bedload movement (flux) of fine grain particulates that cannot be measured using traditional water sampling techniques. Charles R. Bostater, Rotkiske, Tyler, 2016, Fluid Mud Sondes & Acoustic Imaging Methods for Coastal Dredging, ISOPE ISBN 978-1-880653-88-3, 7 pp. Rotkiske, Tyler, Bostater, R. Bostater Jr., 2016, GIS Mapping of Fluid Mud Transport Pre Dredging-, During, and Post-Dredging Agitation, by using Engineered Novel Instrumentation, ISOPE ISBN 978-1-880653-88-3, pp 1542-1547. Bostater, Jr., C R., 2016, A new multispectral imaging instrument for in-situ characterization of flocs & colloidal aggregates in natural waters, SPIE Vol. 9862, pp. 98620k1-10. The above paper describes the operation, design and deployment results of a "floc camera" designed and built by Dr. Bostater. It is used in conjunction with maintenance dredging research in the Indian River Lagoon. The deployment showed how to use acoustic velocity current meters (MAVS) in conjunction with other acoustic sensors, and underwater cameras and sondes. Results demonstrated the resuspension and movement of muck and fluid mud associated with internal waves in the moving lutocline. The floc camera allows one to see and quantify the movement of "estuarine snow". 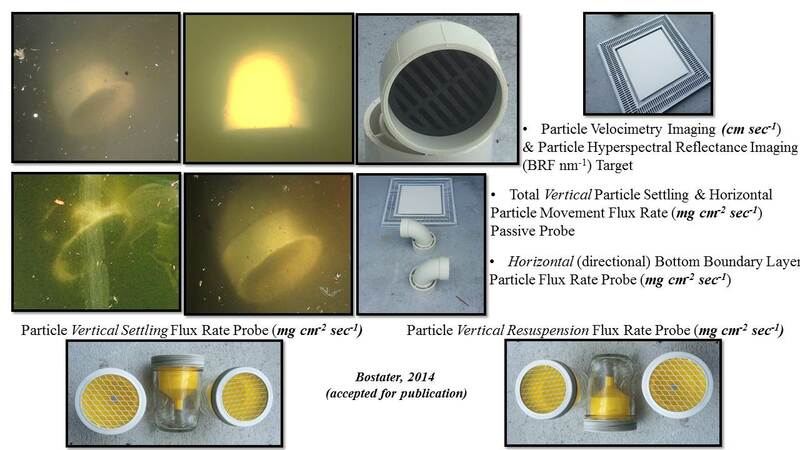 Bostater, C., R., Rotkiske, T., 2015, Moving fluid mud sondes, optical and acoustic sensing methods in support of coastal waterway dredging, SPIE Vol. 9638, pages 96380F1-17. This reviewed paper describes and compares methodologies for fluidized mud and muck sampling and shows results from use of the sondes to compare pre, during and post dredging flux measurements in Indian River Lagoon. The theory behind how the sondes work in the lutocline and pictures of the Sondes are also shown in this paper. US EPA, 1982, Chesapeake Bay Program Technical Studies: A Synthesis, Wash. DC, 636 pp. Bostater, C., Ambrose, B., Bell, B., 1981, Modeling the fate and transport of chemicals in estuaries: current approaches and future needs, In: ASTM (American Society of Testing and Materials) STP 737 Aquatic Toxicology and Hazard Assessment, pp 72-89. Anonymous, 2012, Indian River Lagoon 2011 Superbloom Plan of Investigation, 26 pp. Bostater, C., Yang, B., 2014, Shallow Water Surface Gravity Wave Imaging, Spectra and Their Use in Shallow Water Dredging Operations,, SPIE, Vol. 9240, pp. 92400k1-9. The above reviewed article shows how the sondes were first used in conjunction with wind driven water wave gauges to demonstrate that muck and fluid mud is suspended and moves during high wind conditions. This research continues in the Indian River Lagoon and Banana River using vertical arrays of the sondes during deployment with water wave video analysis. Click here to see a movie of fluid mud. Click Here to see a movie of the mud movement collected from a SONDE.